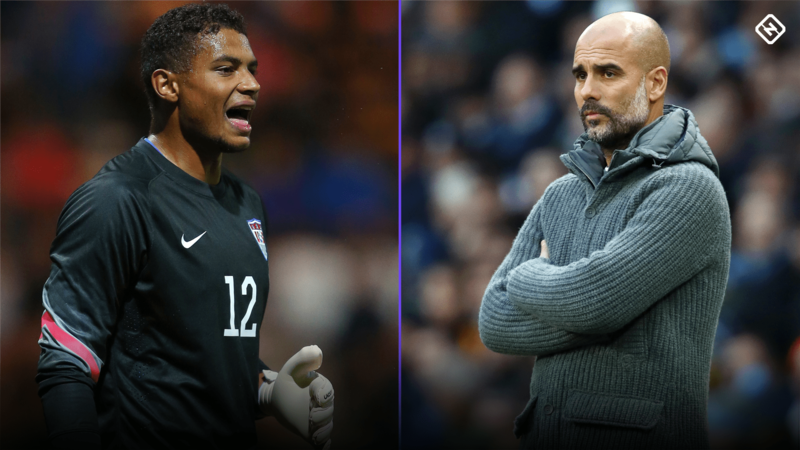 It hasn’t been long since Zack Steffen played in Europe, struggled in Europe and left Europe eager for a new beginning to his professional soccer career. And yet so much has happened since he returned to the United States, nearly all of it wonderful, that it doesn’t feel at all as though he’s heading back too soon to club soccer’s biggest stage. Steffen, 23, will leave Major League Soccer and Columbus Crew SC next July to join the roster of one the richest and most successful clubs in the world: Manchester City FC. His growth during his 18 months in Germany should serve him well as he attempts to seize this new opportunity. “I wasn’t too happy over there, so I came back. But I definitely learned a lot on the field and off the field,” Steffen told Sporting News. “The training over there was great, but I just don’t think I was ready. It showed me what the European style is like, with travels to other countries as well, and all those memories are in my mind as I go through this process. Since returning to the U.S., Steffen has experienced a rapid rise. He went from playing (sporadically) in Germany’s second division to finishing the 2016 season in the USL with the Pittsburgh Riverhounds to becoming the Crew’s starting goalkeeper at the beginning of 2017. He helped the team to a conference-finalist finish by allowing 0.8 goals per game in five playoff games. He starred in the penalty shootout that decided an opening-round victory over Atlanta United. The 2018 season was extraordinary for Steffen. He was named to the MLS All-Star Game, won the league’s award as best goalkeeper and set a club record with a shutout streak of 525 minutes — the equivalent of nearly six games. He also served as the starting goalkeeper for the U.S. men’s national team in six games, including a 1-1 draw against eventual World Cup champion France that included his seven saves. He positioned himself for a move back to Europe, where the world’s top soccer leagues are located, but it was a surprise that Manchester City would be the destination. Man City is the reigning champion of England’s Premier League and is coached by Pep Guardiola, who may be the most respected manager in the game. It’s not certain whether Steffen will spend the 2019-20 season with Man City. It already has a successful starting goalkeeper, Brazil’s Ederson, and it’s possible Steffen will not qualify for a work permit to play in England because he has only six caps with the U.S. national team. “They’re working all that out,” he said. Steffen is not the only member of the Crew heading for a new job. His coach for the past two seasons, Gregg Berhalter, was named the new head coach of the United States men’s national team. Steffen knows Berhalter better than any member of the U.S. player pool save for veteran midfielder Will Trapp. Steffen has an idea what American fans, and American players, can expect from Berhalter. Steffen spoke to SN as part of a program with Allstate, which is providing four college-bound soccer players with $5,000 scholarships. Those players were honored on the field as part of last Saturday’s MLS Cup final. He will leave the U.S. without having reached the goal of playing in that game. It is an odd arrangement that will see him stay with the Crew through about half the 2019 season, but it will help Columbus transition to a new keeper, will allow Steffen to remain sharp by playing in MLS and will get him to England in time to begin preparing for the 2019-20 European season. “I think it just fell at a good time for both teams,” Steffen said. “For myself, I think it will be good to get games through July, continue to lead that team and be a voice from the back and better myself as much as I can. I’ll give everything I have in Columbus and then head overseas. One of the oddities of the United States’ failure to qualify for the 2018 FIFA World Cup is that young players such as Steffen were given significant opportunities to play, against significant opponents such as France, Mexico and Brazil. Those opportunities would not have been available if the Americans were preparing for Russia. It’s not something the U.S. wants to repeat, but there was a positive side.